We brought Sebastian to Amsterdam for the first time. 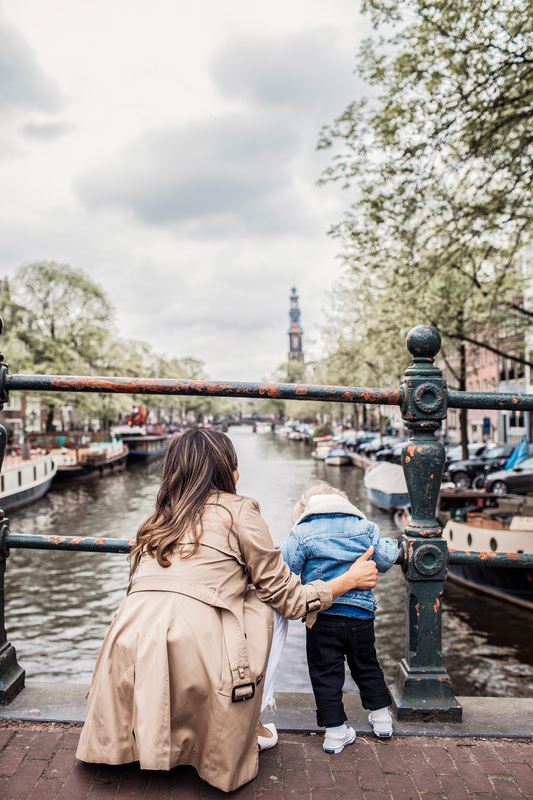 Amsterdam has long been a favorite spot for us and this was our favorite trip here. The last couple of times it was just Matt and I. We brought Sebastian along and it was so much fun! This time out was perfect as we were ready to get out of the cold here in New York City. The sun and amazing scenery just sounded better. When we travel with Sebastian, we try and get direct flights whenever possible. This trip was somewhat last minute so we ended up having to get a flight with one stop in Dublin. It ended up being no problem, and although we didn’t fly Delta, Aer Lingus was great. Sebastian has flown a lot already so he was great for the most part. It’s hard for anybody to sit for seven hours so he needed to stretch his legs and cried a little bit trying to fall asleep. It was fine though. If you’re traveling with a toddler, here are all our travel essentials and tips when flying with a little one. When we landed in Amsterdam, we ended up taking an UBER into the city. It’s a short drive, only about 20 minutes or so. Matt and I usually just take the train from Schiphol to Centraal Starion, but we were with Sebastian and didn’t want to deal with it. Plus, we weren’t staying “downtown” so this worked out better. If you are familiar with Tesla, they use a ton of their cars for car service. I’ve never seen that in any other city, even Silicon Valley. Our hotel, Pillows, was located right off Vondelpark on the north side. It is a fantastic location as it’s only 5 blocks from the hustle and bustle. There is also an entrance into the park less than a block away. Everything you need, grocery, coffee, restaurants, bars, bikes, etc are all close to the hotel. Amsterdam really isn’t very big so you are able to get anywhere in the city pretty quickly by foot or bike. The tram runs right by the hotel so you can pick that up quickly as well. The other reason we chose this spot was that it was easy to get to the highway for when we went out to the tulip fields. We didn’t have to navigate through the city at all. Not that it’s difficult but it was one less thing to worry about. Pillow is a quaint, 3-floor boutique hotel in a 19th-century building. It was just recently renovated in January 2017. They have two really cute reading rooms on each side of the gorgeous dining area and they have a beautiful little courtyard to have coffee in out back. It was just a really great experience all around here. So glad we found it. As I have mentioned on stories, we use Hotels Tonight quite a bit to book last minute hotels. We used them in Palm Springs recently as well for Coachella. The food here was fantastic. We ate breakfast a couple times at the restaurant. Fresh fruit & juice, eggs, pastries were perfect. Simple and delicious. Sebastian even got his own seat and they made him his own little plate of food, which was so nice. They had velvet seats so we had to make sure little one wasn’t wiping his hands on the seats but it was no big deal. If you like taking photos, this is one of the reasons you come here. Around every turn, there is another beautiful row of townhouses that line the seemingly endless canal streets. The colors are gorgeous even when the sun isn’t out and all the bicycles just make for a truly unique photo op each time. We hadn’t been back to Amsterdam in a few years, so we spent a lot of time walking around the neighborhoods, we hadn’t spent much time in previously, Jordaan and Leidseplein mostly. There is nothing that symbolizes Amsterdam more than bicycles. They have bicycle parking lots. Think our parking garages except with bicycles. It’s crazy but so cool. 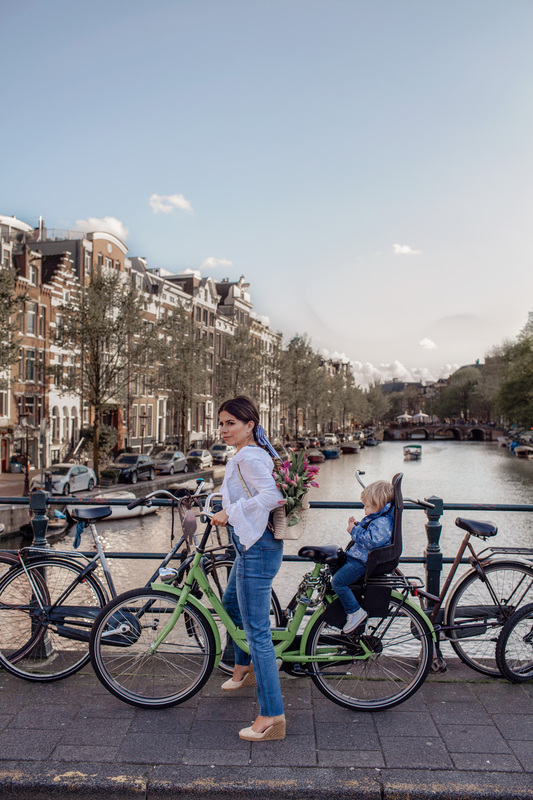 This was the first time we rode bikes in Amsterdam and it just so happened to be the very first bike ride for Sebastian. It was a highlight of the trip to ride around with Sebastian on my bike behind me. While he lost interest after 20min or so, it was still a lot of fun. One of the greatest parts was Matt forgot how to use the pedal brakes. He is so used to his brakes by his gears that he had to stop with his feet a few times. Hahaha. He was so confused. It was great. It may seem daunting with so many bicyclists, but it’s no big deal. Just follow the lanes and you are golden. 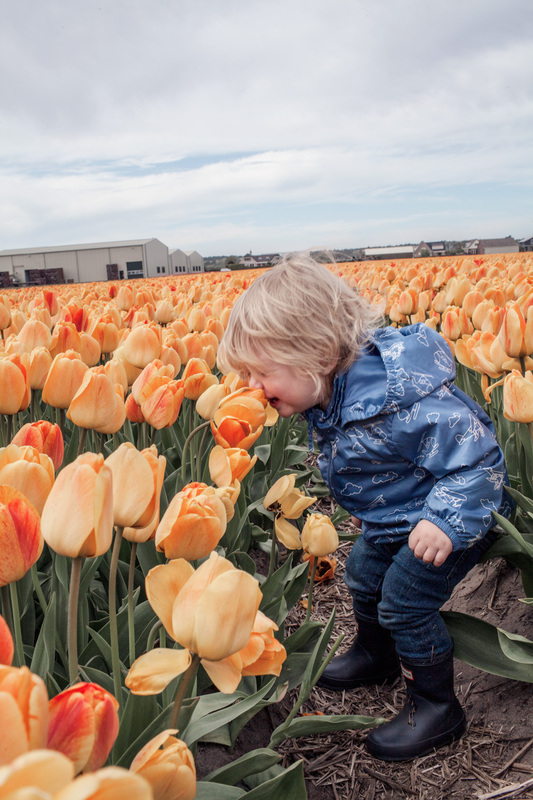 Lisse is why we decided to head back to Amsterdam this year. We had never seen the tulips in bloom on previous trips and we wanted to make sure we didn’t miss them this year. You never know when the tulips will bloom based on that year’s winter and you only have a 6-week window once they do. Hence, the last minute trip. From our hotel, Lisse is only 30 min away. 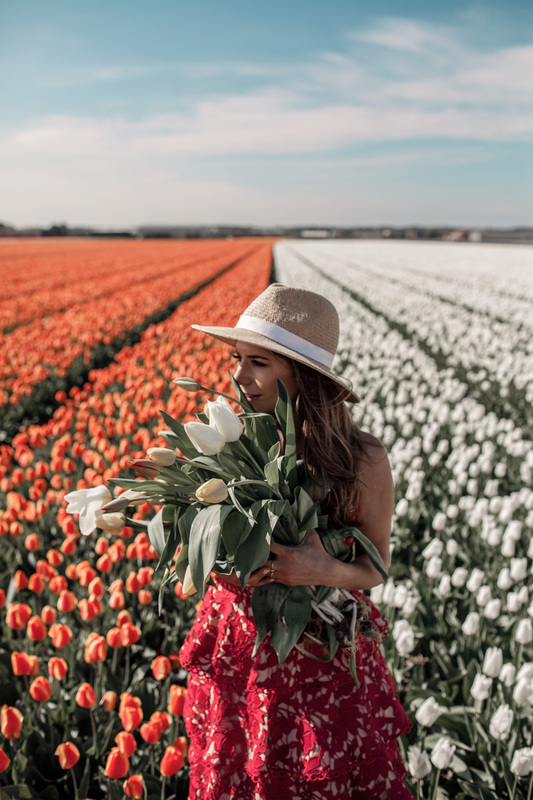 Before going to Keukenhof, the garden of Europe, the most beautiful place I have ever seen, we drove around the countryside looking for the perfect fields and away from the crowds. As beautiful as all the pictures you see on social media, it’s even better in person. When we saw fields we liked, we simply pulled over and went into the fields to shoot. It worked out perfectly. Once we finished with pictures, we timed it perfectly so we got to Keukenhof Gardens with only an hour or so left from closing. The crowds had died down and we got to enjoy it without a ton of people. Tickets are $22 and Sebastian was free. We almost decided not to go but so glad we ended up going in. It was an amazing way to end the trip. Even if you can’t make it out in the spring, the Dutch countryside is so beautiful and well worth a few hours of your trip to get to see part of this amazing country. This is one of our favorite spots in Amsterdam. On our last trip, we just randomly found it walking around the neighborhood. It is a meat lovers dream. So delicious. Since I’m not really eating meat anymore, we didn’t go this trip but the place is 5 stars. Cool atmosphere and great food. Definitely a late night spot after a night out. Probably not a place you would typically go on vacation. Haha. However, you just got a try it once. Needless to say, it’s a younger crowd that frequents this eatery. Neat little coffee spot on the other side of Vondelpark from us. Great coffee and pastries. Good for a quick stop in and then bike in the park or visit one of the museums. A couple nights, Matt and I ate in the room while Sebastian was asleep. With a little one, you end up making the most of these situations, where you are stuck in the room. We ordered room service one night as well. Matt would run down to the grocery store and pick up some bread, cheese, and wine. It actually worked out great. If you like cheese than there may not be a better city in the world to enjoy it. 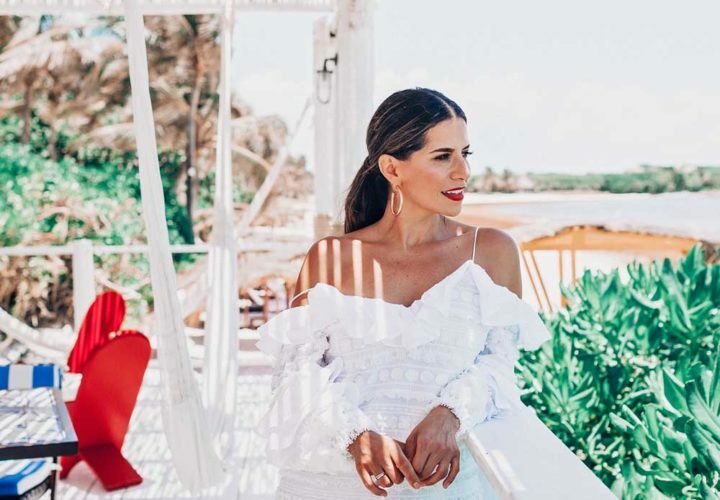 Here’s what I wore on our trip to Cartagena. We were shooting content while traveling, so my outfits were a little more dressed up. You’ll likely be doing a lot of walking, so I highly recommend a comfortable pair of shoes. I wore my wedges most of the trip. These slingbacks were perfect and stylish for walking around Amsterdam. (Plus, they’re currently on sale!) A couple great pairs of pants is always a must when traveling. I recommend this pair by Mother, Liverpool Jeans, and Madewell. 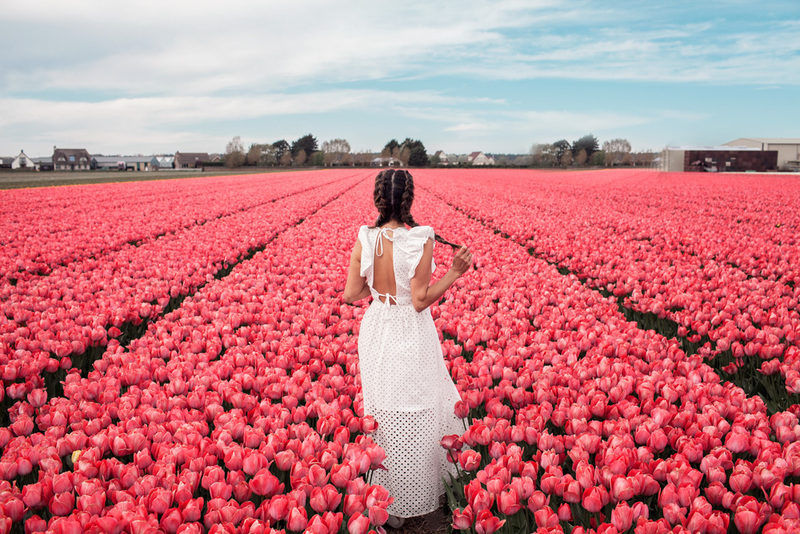 Dresses are a must for the Tulip fields. I loved this one by Endless Rose. Would love to hear any great spots we missed so we can be sure and check them out next time we are in Amsterdam. Thanks so much for reading and following along with us! These photos are beautiful! I want to go back during tulip season.